Progressive Insurance announced Thursday that December 2011 profits were down nearly one-third from the year before, dropping from $112.8 million in December 2010 to $76.3 million a month ago. The results for the fourth quarter of 2011 are a little bit rosier. The year-over-year change in profits for that period was a decline of 14 percent, from $299 million to $256.7 million. Much of the fourth-quarter drop can be attributed to a decline in investment gains. Fourth quarter 2011 gains were down 62 percent when compared with 2010. But the results are still a marked improvement from the insurer’s performance in the third quarter, when the company posted a year-over-year decline in profits of 42 percent. 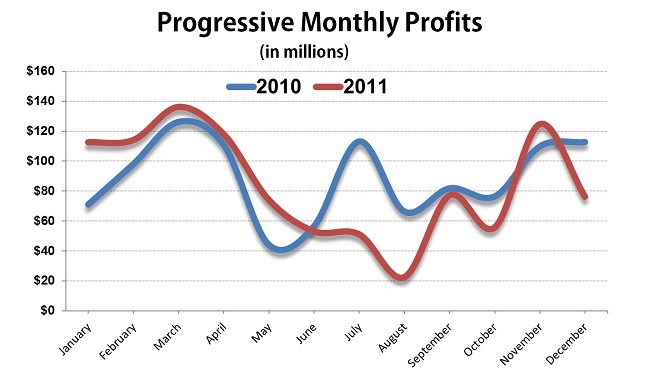 Progressive has seen year-over-year drops in profits in five of the last six months. When comparing 2011 with 2010, profits for the insurer, which relies heavily on the business of consumers who want to get auto insurance quotes online and buy without having to interact with agents, fell by a total of 5 percent. According to a report released last month by the Insurance Information Institute (III), coverage providers could end up spending $35 billion to settle claims for damages suffered by claimants as a result of natural disasters in 2011. The ISO and the Property Casualty Insurers Association of America (PCI) reported last month that insurer profits dipped to a combined $8 billion January through September, a 70 percent decrease from the same period in 2010. Insurers said the decline was largely the result of natural disasters, including Hurricane Irene, which caused an estimated $7.3 billion in insured losses when it swept along the East Coast in late August. But industry insiders expect things to look up in the coming year. The Insurance Information Institute (III) points out that 75 percent of U.S. property and casualty insurers expect the industry to see increased profits in 2012. A recent III survey found that 72 percent of industry executives believe the industry is recovering after natural disasters and other setbacks inflicted deep losses in 2010.